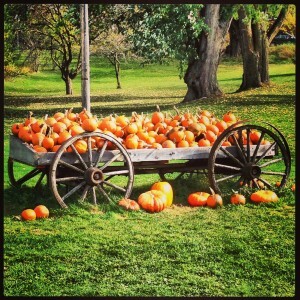 Last fall, my sweet children took us to Vermont to the Trapp Family Lodge for my birthday. I am a Sound of Music addict, so you can imagine my delight when they announced the plans. The views were breathtaking from the mountains, and there were pumpkins everywhere. 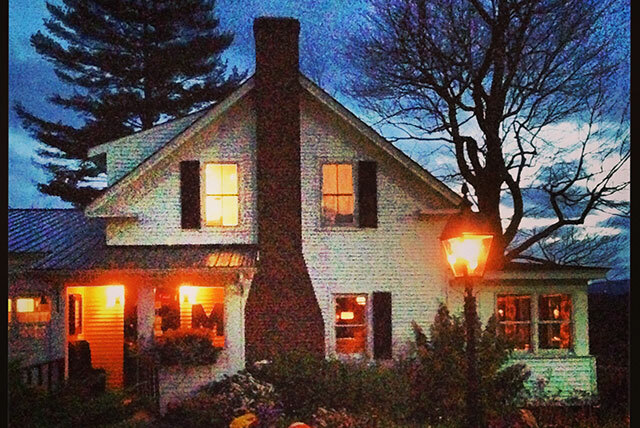 My birthday dinner was at a lovely restaurant that was a converted farmhouse. The setting was gorgeous, and the evening was perfect—candlelight and all. My two precious grandchildren were marvelous at a longer-than-usual supper. One of the most fun things happened quite by accident. We were having a casual lunch at an outside café when my grandchildren, Hays and Amelia, spotted the apple trees. Several had fallen to the ground, and they began to gather them and bring them back to the table where we were seated. They were so excited to see trees apples with apples hanging from them and to shake the branches while apples fell. As they gathered, the owner came out and, to my delight, she insisted that they keep them. 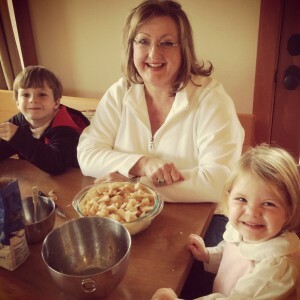 When we returned to the condo where we were staying, we decided we would make an apple cobbler, but we had very little to work with in the kitchen. So we sat down and peeled the apples, chopped them up, and filled a glass Pyrex bowl. Then we scooped sugar onto them along with butter, cinnamon, and Bisquick batter for the crust. Into the oven it went and baked for about an hour. Out from the oven came the most delicious cobbler ever! Hays and Amelia were just delighted, and we all gathered around the fire and enjoyed our creation. I think those little hands helping made the pie delicious. From gathering apples to eating the cobbler, my little ones got to see how apple pies are made. As the warm days of summer give way to cool, crisp days, I long for the beautiful foliage of fall. Autumn heightens my senses and makes me appreciate the beauty of the world we live in. It’s time for an apple pie, isn’t it? Heading to the kitchen right now to start baking! Can’t wait until my husband comes home and says”UMMM what smells so gooood.” Thanks for the inspiration! I just read a book this summer called “Forever Liesl” by Charmian Carr. It is her autobiography, and mostly about her experience working in the movie and her relationships with the cast. A very sweet read, if you can locate a copy! Mine was at the local Friends of the Library bookstore. Thanks for sharing your fall memory, and reminding us of that all-time great family film. Oh my, this brought back so many wonderful memories! I, too, am a “Sound of Music” addict and was fortunate to be able to go to Salzburg a few years ago and do the Sound of Music tour. I have seen the movie multiple times and cry each time I watch it. It was such a sweet love story and reminds me of my own. I have just reconnected with an old boyfriend after 54 years and we’re getting married on my birthday in October!!! Hmmm … wonder if I baked him that apple pie, I could entice him to take me to the Trapp Family Lodge for my birthday?! Thanks so much for sharing, Phyllis, and thank you, Elaine, for the recipe! Love your posts!!! My Sound of Music story is a little different. I have always loved the movie as well. Vividly remember the first time I saw it with my mother. About 10, maybe 11, years ago our whole family spent Christmas at my parents and we watched “The Sound of Music” on TV. Being just a little bit tired, my sister and I were a little slap happy. I don’t know why, but we kept joking about the goat herder song, never dreaming that in a few months my daughter, Allison, would meet her future husband, who although no goat herder, is Austrian. And we now have 2 wonderful grandsons. I so very much enjoyed reading this blog post! You expressed the beauty and essence of fall in a few short words. I can smell the pie and see the delighted little faces as they watched that pie bake. yum. I must pick our fall apples this week before the weather turns around. Thanks for the sweet reminder. You have a beautiful memory and I have to say I love fall too. I have a fall birthday and my family usually spend a day at an apple farm picking apples and then coming home and making apple sauce with at least 10 lbs of the apples. The rest is for lunches. I love reading your blog and the comments and memories that your memories evoke. Autumn is my favorite season. I like it so much I am having a giveaway titled “change of season” ( I invite you to stop by and enter). The crisp air the amazing colors. I love it all! 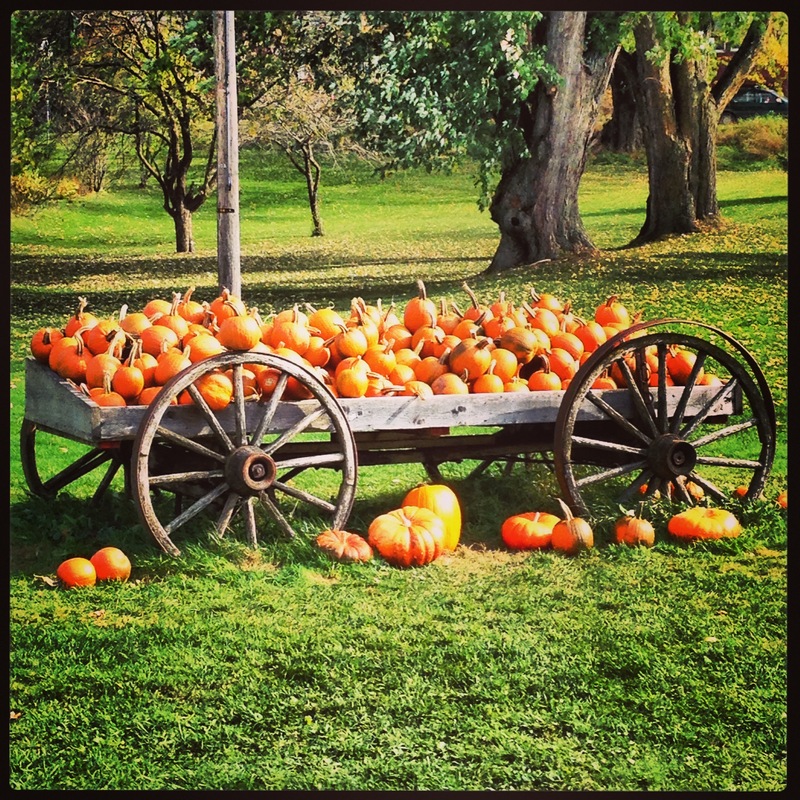 This was a wonderful blog today – fall colours, apples, family treasured moments that you so generously share. I, too loved the Sound of Music. I remember watching it with my 4 year old son, who was mesmorized by the music and the antics of the Von Trapp children. When the family took to the hills and sang together, my son looked at me and said, “mommy, my eyes are dripping”. And so were mine. I now have a granddaughter whom I will share all my treasured moments and memories. I look forward to her little hands helping me in the kitchen. 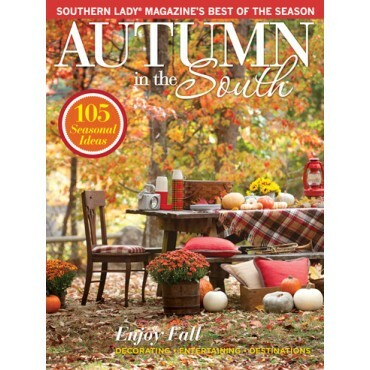 What a lovely memory, like so many, Fall is a favorite time of year for all the reasons listed. Today though was an especially sad day for me as my mom passed 3 years ago on this date. Your memory post brought a smile and a feeling of warmth. Thank you for sharing your life with us. In addition, I find I am blessed by the kind and thoughtful remarks of your readers. Thank you. 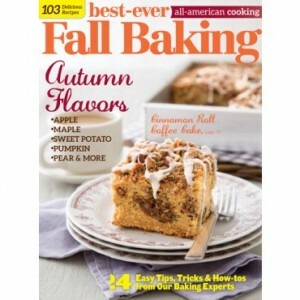 Like you, Phyllis, I have a fall birthday and love the fall season best. Like you, I also have been a lover of “the Sound of a Music.” In fact my grandson recently appeared as Kurt Von Trapp in his high school production and did a marvelous job, not that I am at all biased! I really enjoy your posts and as soon as I finish reading one, I look forward to the next one with great anticipation. Thank you for sharing with us. What a lovely (and delicious) memory for you and your grandchildren. I am lucky enough to live in new Hampshire, and we also have a place in western Maine, so Fall is beautiful for us. And it’s only “officially” Fall when I bake the first Apple Crisp of the season. My daughter is far away in California, but she carries on the tradition with “mom’s” Apple Crisp too. This is actually a CRISP, not a cobbler, but it’s yummy. It’s from the 1986 edition of the Fannie Farmer Cookbook. 5C peeled, sliced apples, 3/4 C flour, 1C sugar, 1/2 tsp cinnamon, 1/4 tsp salt, 1/4 lb butter, in small pieces. Preheat oven to 350*. Butter a 11/2 qt baking dish, spread the apples in it, and sprinkle 1/3 C water on top. Combine flour, sugar, cinnamon and salt in a bowl, and rub in the butter with your fingers until it resembles coarse crumbs. Spread evenly over the apples. Bake for about 30 minutes or until crust is browned. Serve warm with heavy whipped cream or vanilla ice cream. Heaven! 2 refrigerator pie crusts. Take one and line the pan or glass baking dish. Cut up apples to fill the pan. Mix 1 cup sugar, 1teaspoon cinnamon, 1/2 tsp nutmeg. Sprinkle apples with sugar mixture. Use more sugar if you pie is big. Cut 1 stick butter into chunks and spread on pie). Cover with 2nd crust. Bake until crust is golden brown. I think 45 minutes. Now this pie is not thick and gooey. It is very liquid and my family loved it. I am a dab of this and that cook. If you want gooey, then add 1 tablespoon flour to the sugar mixture. Bake at 350. Thank you so much for your beautiful stories. I’m delighted when I turn on my computer and there you are. It just makes my day. Fall is also my favorite time of the year. Love the turning of the leaves, they are so beautiful. Your story about your birthday trip sounded wonderful. I agree your grandchildren are adorable. What great memories they are making. I had to respond to this blog, Phyllis. I’ve adored the Sound of Music since it debuted in 1965. My parents took me and my sister and I was enthralled … and never lost that delight. Someday, I would love to visit the Trapp Family Lodge. Thank you for sharing your experience there (your grandkids are adorable). Also, since you do needlework (I’ve been a JCS subscriber for more years than I can count! ), I just discovered a delightful design based on the Do Re Mi song from the Sound of Music. It is by Silver Creek Samplers and the series is called ‘Sing a Sampler’. There are four charts. Thank you for your lovely blog. I enjoy it everyday. Thank you so much for your memories that you shared. The sampler sounds great! I love the fall season – it’s my favorite. I have a wonderful apple pie recipe that you bake in an iron skillet. My family loves it! Your grandchildren are adorable and Amelia looks like you! I hope your arm gets better. Sounds very painful. Best thoughts for you today!!!! We have our own apples and pears and the best part is watching my grandchildren pick them and eat them. We do enjoy our apple pies too in the Fall. Fall is my favorite time of year,. The colors, the food, the football—everything. What a wonderful story! Thank you so much for sharing it with us. Your grandchildren are adorable. Happy, Happy Birthday with may more to come! What a wonderful Birthday memory, I love reading about your family’s moments! It usually snows here in Alaska before we get to enjoy Fall’s full beauty so I love cherishing other families’ experiences with my favorite time of the year! What a fun way to spend a birthday…best wishes. Apple pie brings back the best autumn memories for me. My parents would pick apples at an apple farm and then my mother would bake her special apple pie. It was different than most pies and she and her pie became quite popular especially Sunday afternoons in October and November when family and friends would drop by for a delicious slice. Sadly, that pie is just a memory now since my mom has Alzheimer’s and hasn’t t baked for a few years now…but this time of year I can almost taste and smell that wonderful apple pie! You are always surprising others. I love this post; thinking of the joy your family gave to you! Oh so lovely … Your little ones are adorable. Happy Birthday to You & many, many more. I can feel the abundance of love right through the computer screen! birthday memory. Those little ones are precious. Have a wonderful day.